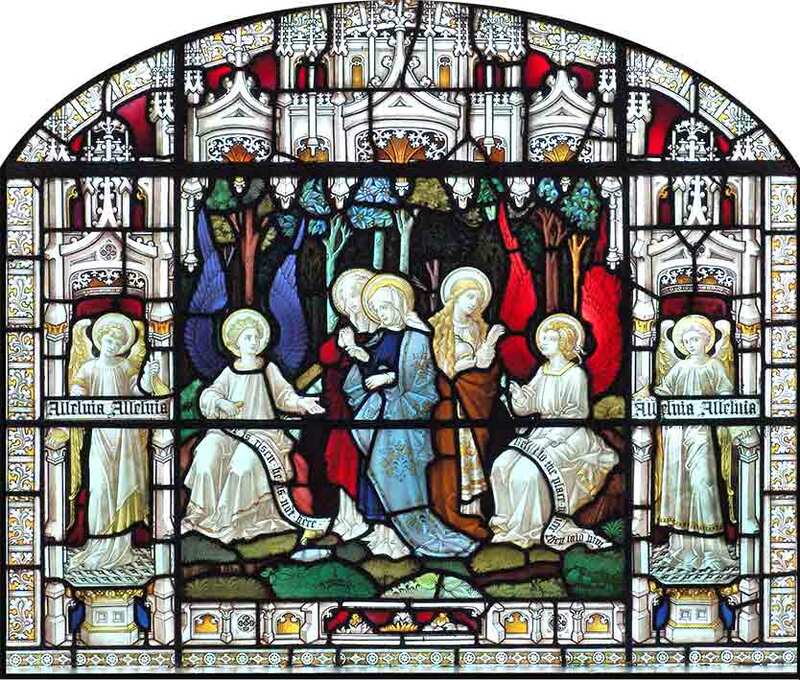 Main window of St. Barnabas Episcopal Church, Irvington, NY, showing Mary, Mary Magdalene, and Joanna discovering the empty tomb. 407 people in our community are currently praying with you. Our “Virtual Sunday Church” this week takes us to Morriston Chapel in Swansea, Wales. Lyrics to "Guide Me O Thou Great Redeemer"
- the Spirit of Fear that I may be filled with a loving reverence towards God and may dread in any way to displease Him. Mark me, dear Lord with the sign of your true disciples, and animate me in all things with your Spirit. In Christ's name, I pray that the Spirit may be with me and fill me, today and throughout the week to come. Archangel Michael by August Vogel, ca. 1907. 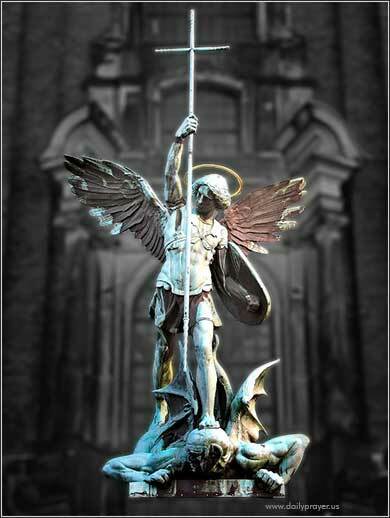 This statue of Michael triumphant over Satan, taken from Revelation, stands in front of the Church of St. Michael in Hamburg, Germany. The Book of Wisdom (of Solomon) is part of the canonical Catholic and Orthodox Bibles (technically, they are called “Deuterocanonical”), but part of the Apocrypha in the Protestant Bible. These 7 books (plus another 7 considered apocryphalApocryphal: Of doubtful authenticity, although widely circulated as being true. in both Protestant and Catholic Bibles) were written before the time of Christ, but have been separated from the Old Testament. The Catholic and Orthodox churches accept the Apocrypha as part of the divinely-inspired Bible; that is, they consider it Scripture in the full sense. Protestant churches generally accept the Apocrypha as sound (and recommended) religious reading, but do not consider it "canonical", that is, inspired by God, to be read as part of His holy Word. The Apocrypha has disappeared from modern Protestant Bibles, not for want of merit, but for practical reasons: the Bible is already “too big” without them. So the 7 to 14 books disappeared from the English Revised Version of 1881, which was copied by the American Standard Version in 1901. The books of the Apocrypha are not a cohesive work; they are very different from one another. What they share is that they were not written in Hebrew (part of the reason the Protestants did not include them in the canon) and do not claim, in their text, to be the Word of God. Some of them contain valuable history (such as 1 and 2 Maccabees); some of them are astonishingly beautiful religious poetry (such as Ecclesiasticus); some of them are generally considered to be fictional and should be read as allegory. It is important to differentiate the Apocrypha from another group of books, which are called pseudepigrapha Pseudepigrapha: A work falsely attributed to someone who did not write or approve of it, from the Greek words “pseudo”, meaning fake, and “epigraph”, meaning inscription. , to use the five-dollar word, and are completely rejected by most Jews and/or Christians. These are “New Testament” works that pretend to have been written by someone who had no actual connection to them, e.g. The Gospel of Mary or The Gospel of Thomas. These are outright fakes. The best-known examples are the Gnostic Gospels, which all mainstream Christian churches consider heretical and even evil. Today's reading is a perfect example of the Apocrypha's importance. It develops a theme not treated in the Old or New Testaments, which might be helpful to many Christians: God gave us our intelligence to understand science and history. Too often and much to their detriment, churches have become defensive about scientific and historical knowledge, even to the point of forcing conflict between the Bible and science where none exists. The most famous example would probably be Galileo, whose astronomical findings were suppressed by the Catholic Church, even though one is hard-pressed to see how the Bible claims that the sun revolves around the earth. God gave us our brains to help us “be fruitful and multiply” and He expects us to use them. There is no conflict between scientific truth and Biblical truth. We must be careful, however, be careful to distinguish truth from conjecture or opinion, both in science and religion. Both are worth unending study and constant prayers for guidance by the Holy Spirit.